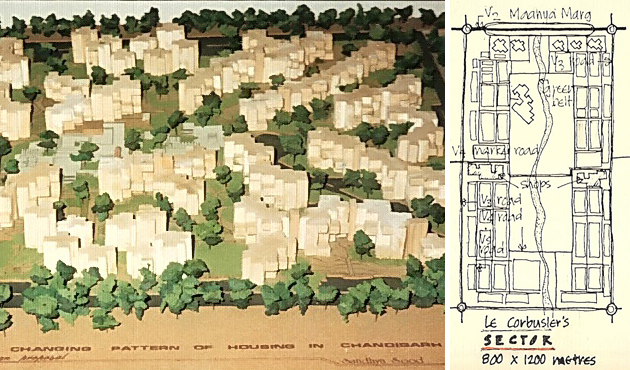 The Changing Pattern of Housing in Chandigarh – A Critical Appraisal, an undergraduate thesis, excerpts published in a book paved the way for this housing proposal exhibited at the Government Museum and Art Gallery by the Indian Institute of Architects (IIA) for the World Habitat Day in Chandigarh, India. The design concept aims at re-urbanizing the city with increased density in housing and challenging the grid at the micro-level of a ‘sector’ to create a new paradigm for urban neighborhoods in and around Chandigarh. The design and layout incorporate flexibility and reuse in space and time, adapting to changing needs, and feature an architectural language that creates a dynamic environment to facilitate social interaction. Three new multifamily housing typologies emerged from a radical re-appraisal of traditional ‘mohallas’, or neighborhoods in a unique modern aesthetic are located along four diagonal streets culminating at the ‘chowk’ or town square, the nucleus of the community.